The Colorado Recovery and Resiliency Collaborative began after the recent floods and fires in an effort to learn lessons from the disaster and to find ways to improve disaster response and preparedness throughout the state. The group works with agencies and organizations active in disaster recovery to share their experiences and work together to find creative solutions to common issues and challenges. Through experience, knowledge and mentorship, the mission of the Collaborative is to promote, educate and assist communities throughout Colorado to recover quickly and resiliently from disaster. Create, improve and promote resilient communities through mentorship and guidance in recovery. Formed in 2015, the Colorado Recovery and Resiliency Collaborative (CRRC) is a convergence of local, state,and federal representatives working to improve communications and coordination between organizations involved in Colorado's flood and fire recovery. The ultimate goal of the Collaborative is to more resilient to environmental hazards and disasters. Throughout the last two years, CRRC members have analyzed the recovery processes following floods and fires in the state, and as a result have conceptualized critical lessons to be learned. These takeaways are presented below in the form of strategic recommendations for state, federal, and local entities, in order to increase the quality and efficiency of recovery for future disasters. The Local Government Guide to recovery is a planning tool for those trying to develop or bolster an emergency management program, as a reference to be used when an incident occurs, and as a guide when emergency management personnel want to ensure that they are not missing any essential steps in supporting their community through recovery. The Guide is organized chronologically, starting with the pre-event planning that is the most critical to success once an event occurs, followed by the immediate recovery needs that occur during the response phase. The guide also provides a framework for capturing lessons learned and maintaining this guide as a living document so that we continue to strengthen recovery in Colorado for years to come. The “Putting Disaster Recovery Lessons Learned Into Action” meeting was a facilitated discussion of lessons learned about disaster recovery following the recent floods and fires in Colorado. The event was an opportunity for agencies and organizations active in disaster recovery to share their experiences and work together to find creative solutions to common issues and challenges. The meeting was held on May 14, 2015 from 11 a.m. – 4 p.m. in the Longmont Public Library in Longmont, Colorado. This report documents the results of the meeting and is organized chronologically, except for Next Steps, to follow the meeting agenda. This report focuses on emergency management for flooding, the most common natural hazard. However, the majority of principles highlighted here can be applied to virtually any emergency or disaster situation. County best practices from across the nation are used to underscore and exemplify each resilience strategy. A number of research organizations have also shared practical approaches that counties can utilize to increase their resilience and decrease the impact and cost of disasters. While each of these processes can vary to a certain degree, they all emphasize the need for stakeholder engagement and the development of a comprehensive risk assessment. A robust risk assessment identifies and assesses local infrastructure and the built environment, shocks and stresses, laws and regulations and social service needs within the community. 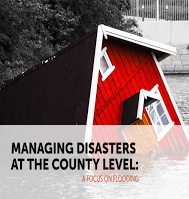 County leaders can use this report to better understand the emergency management cycle and the breadth of resilience strategies available as they work to make their counties more resilient, healthy and safe for residents. Coloradans are familiar with the threats and impacts of disasters. Mother Nature has brought droughts, wildfires, floods, tornadoes, and even earthquakes to communities throughout the state. In the past decade, Colorado experienced a nearly $4 billion flood in 2013, wildfires in 2010, 2012, and 2013 that destroyed nearly 1,250 homes, a tornado that left a scar through multiple communities in 2008, and many others. While the disasters have made their mark on Colorado communities, they do not define Colorado. Rather, the strength, determination, leadership, and compassion shown by Coloradans to recover and to ultimately make Colorado better, stronger, and more resilient is the story. True resiliency requires coordination and collective action from a broad range of stakeholders. This Framework provides a starting point to guide activities that will be undertaken by state and local government, non-profits, businesses, and community members. It is not enough to survive - our aim is to thrive. six months to develop resiliency strategies for the future of Larimer County and its communities. The vision of this Larimer Community Resiliency Framework is to create a connected, collaborative, and cooperative region that proactively works together to strengthen systems and to resolve complex issues. The Framework outlines the first steps in making this happen through a series of goals and actions. The Framework is a living document, and will require ongoing support to keep up with our changing environment. Over time, we will complete actions and add new ones. The work on resiliency has not ended this Framework is merely the beginning. The Larimer County Resiliency Steering Committee vows to sustain the momentum and guide the Framework from initial actions to long-term resiliency. BoCo Strong’s mission is working to increase the web of connections among individuals, organizations and governments across Boulder County in ways that will foster inclusivity, increase disaster resilience, and build vibrant and prosperous communities. Resilient Together is the place to share, learn, and build community to thrive through challenges and change in Boulder, Colorado.